Xoan singing of Phu Tho province was recognized by UNESCO as a World Intangible Cultural Heritage in late 2017. Dating back to the Hung Kings dynasty thousands of years ago, Xoan singing is traditionally performed during the Hung Kings Festival on the 10th day of the 3rd lunar month. In the lead-up to the Hung Kings Festival, which will fall on Sunday this year, Xoan guilds were busy rehearsing their performance. Phan Thi Kiem of Kim Dai ward, Viet Tri city, wearing a kerchief and ao dai traditional long dress, was taken to the communal house by her grandchildren in the early morning. Despite her 110 years of age, Kiem sings very well. She is one of the first 17 Xoan singers to be honored with the title “Emeritus Artisan” by the State. Two youngsters named Le Thi Thu Ha and Ngo Quoc Cuong are singing a Xoan song called “Growing cotton, ploughing beds for beans” with some village elders at the Kim Dai communal house. Ha and Cuong are the 4th generation of 2 families of Xoan singers in Phu Tho. Veteran singers like Emeritus Artisan Le Xuan Ngu, chief of the Phu Duc Xoan guild in Viet Tri city, taught Xoan singing to the young people. Since Xoan singing was recognized as a World Intangible Cultural Heritage, Phu Tho province has implemented several programs to preserve and promote this art. The number of Xoan singing trainers has increased from 7 to 70. 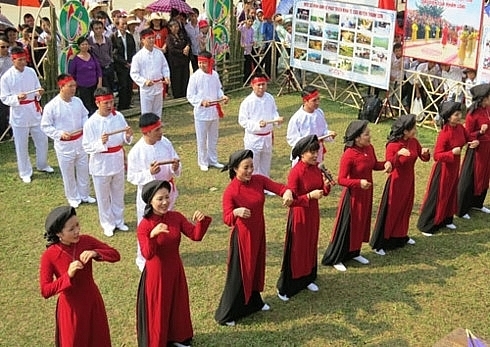 In Phu Tho, there are 4 Xoan singing guilds: An Thai, Thet, Phu Duc, and Kim Dai. 31 basic Xoan songs have been documented and 19 relics associated with Xoan singing have been restored. Music researcher Dang Hoanh Loan said that because Xoan singing is a type of folksong sung for cultural rituals at communal houses, temples, and pagodas, it’s essential to preserve those venues.